With plush suspension, a silky smooth power delivery and a brilliant level of agility, the GSX-R125 offers the perfect introduction to the world of sports bikes. With a hunched riding position, appropriately angled clip-ons and handling to match, it’s low enough and light enough to be unintimidating to novices, yet is perfectly capable of being pushed to its limits when you want to have fun. 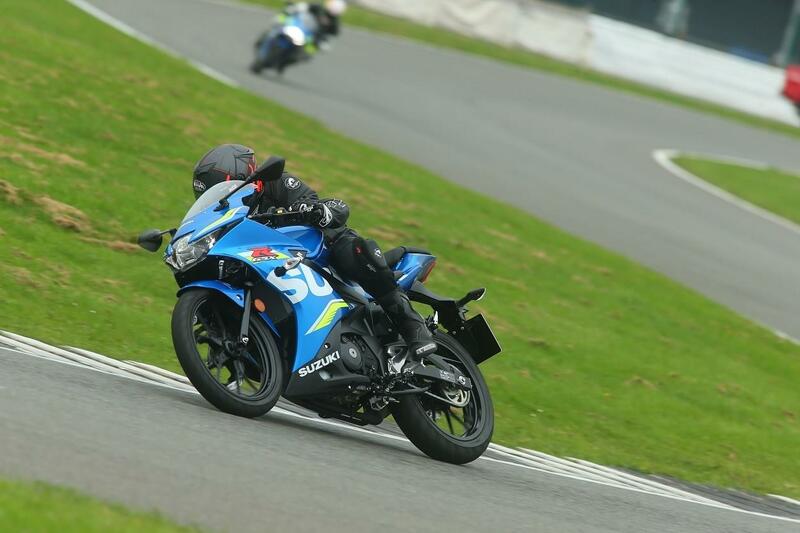 The ride on the GSX-R125 is also surprisingly firm and plush, inspiring more than enough confidence to get your knee down, should you ever find yourself at a track. Despite being firm, the ride is also forgiving enough to be comfortable over the bumps and potholes that litter our British roads. Compared to rivals like the KTM RC125 and the later incarnations of the Yamaha YZF-R125 the standard fork set-up does look comparatively cheap, however it is still well damped and more than adequate for any new rider. The quality ride is only complimented by the Dunlop D102 tyres, which come fitted from the factory and offer plenty of grip for a bike of this size. I rode the bike in the dry and in spitting rain and they were perfectly happy to take the abuse - only beginning to feel vague when pushed in the wet. Stopping power is also impressive, with the single waved front disc and lightweight two-channel Bosch ABS unit offering a reassuringly progressive bite, without too much intrusion from the electronics. The rear brake also works well when used in tandem, however needs to combined with the front to bring you to a stop. 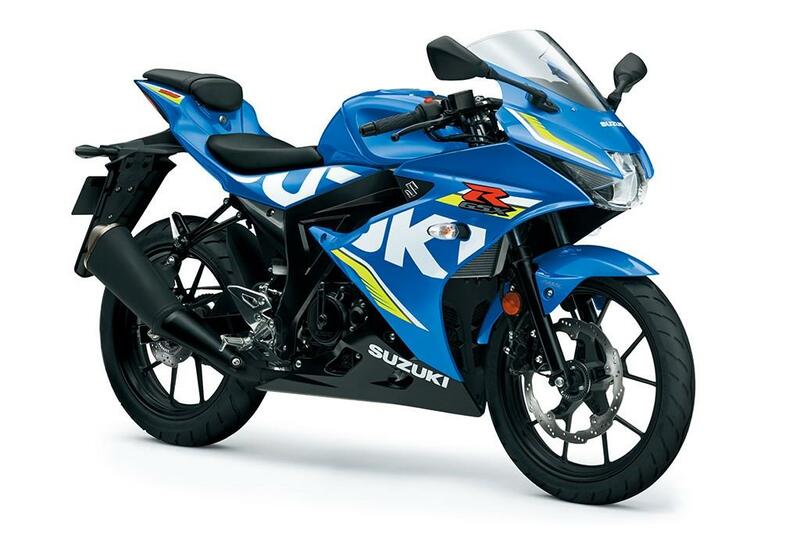 At the centre of the GSX-R125 lies an all-new double-overhead-cam 124.4cc single-cylinder motor, producing 14.8bhp. For such a busy little engine, the power delivery feels linear and silky smooth, revving freely throughout the range. Acceleration is also more than adequate for a bike of this size, thanks to a kerb weight of just 134kg, making it the ideal tool for nipping between cars in traffic, as well as the occasional backroad blast. The bike also sounds good, delivering a throaty, if slightly whiney growl, which is reminiscent of a muffled Moto3 bike, even with a standard Euro4 compliant single-sided, dual muffler exhaust. The lightweight clutch is also incredibly user friendly and makes low speed manoeuvres a doddle, which is handy for new riders taking their first steps into motorcycling. 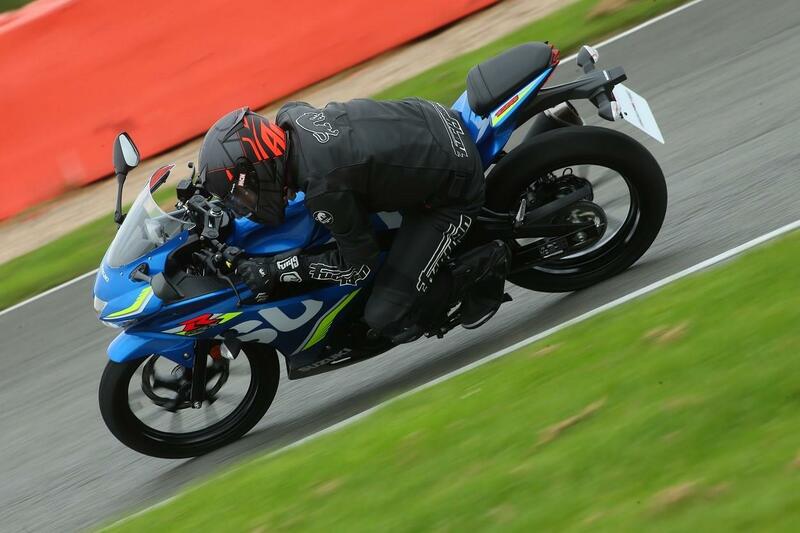 As well as having plenty of poke for its size, the GSX-R is also incredibly frugal and after 12 20-minute track sessions around the Stowe short circuit at Silverstone, the bike’s digital display was still reading 69.5mpg. The gearbox can be quite stubborn when trying to click into first gear from neutral. Once in gear though, the shift is perfectly smooth, with no false neutrals up or down the box. Coming down the gears, I did sometimes find myself missing a couple of changes, by naturally striking the front of the gear linkage, rather than the shifter itself. 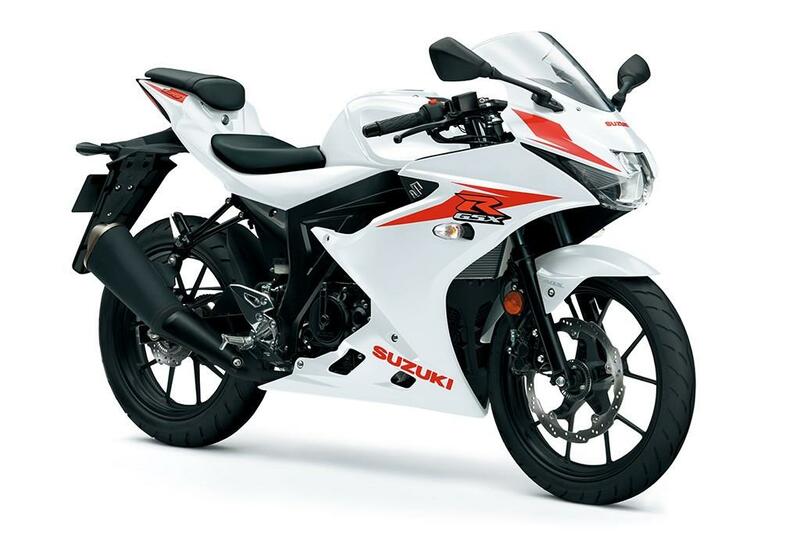 There’s a premium finish to the paint and, side on, it looks almost identical to some of the larger GSX-Rs in the range. The tacky plastic has been kept to a minimum and the mirrors offer plenty of visibility without being swallowed up with your own elbows. At £4099 for the model we tested (£100 more than the standard colour schemes) this bike is very competitively priced. Sitting slap-bang in the middle of the premium sports 125 class, the GP rep is £200 less than a KTM RC125 and a whole £600 less than Aprilia’s RS125 and, although the Honda’s CBR125R is slightly cheaper, the Suzuki looks more modern and exciting and comes with more features. 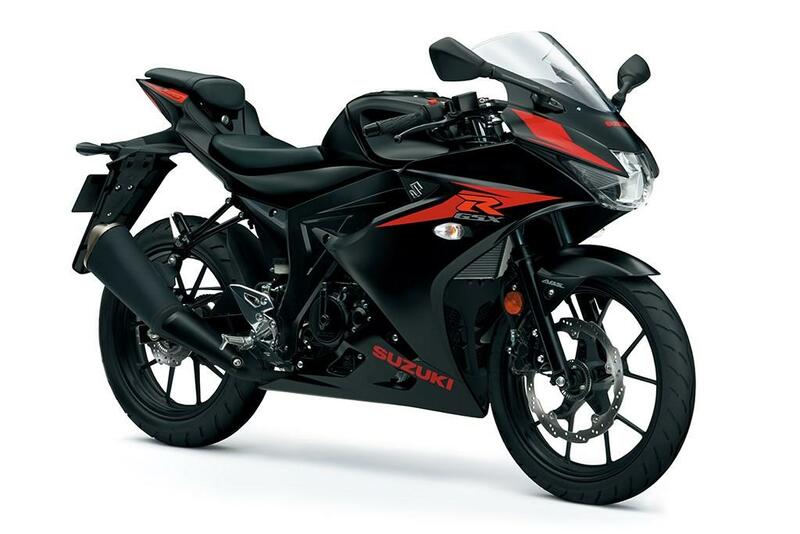 With neat digital clocks, complete with such features as a gear indicator, an adjustable RPM indicator and fuel gauge, the GSX-R125 feels like a quality product. There’s also a keyless ignition system, which means the bike won’t start unless the specialist key fob is within around a meter of the machine - offering an added level of security when you’re off the bike. However, should you ride off and leave the fob behind, the system won’t recognise it’s missing until you next come to switch the bike on. Suzuki supply each bike with a failsafe pin to combat this though. 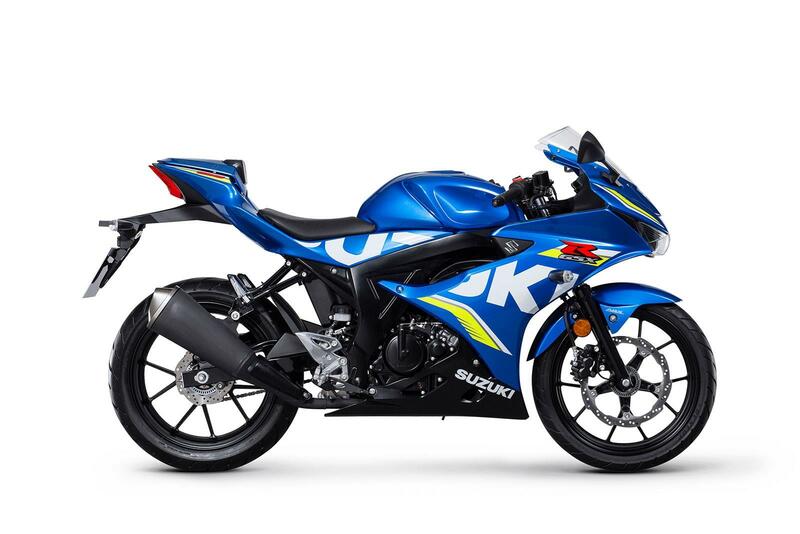 No owners have yet reviewed the SUZUKI GSX-R125 (2017-on).